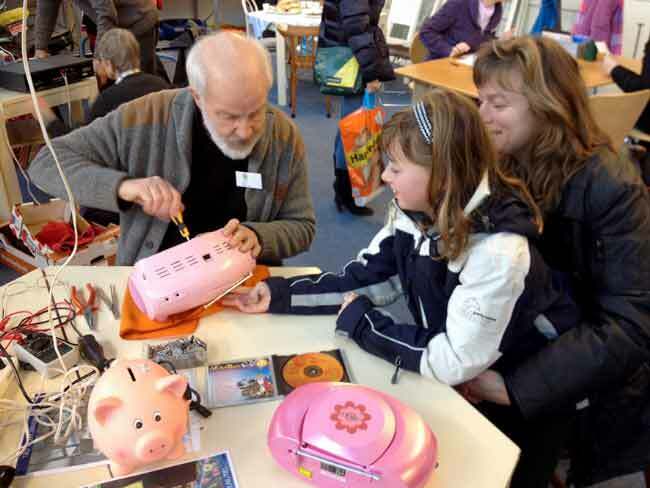 A Repair Café is a meeting place where people work together, with the help of experienced repair people, to mend broken household items that they bring in. The usual items are electrical appliances, furniture, clothing, toys, or just about anything thing that you can carry in by yourself. There is no cost, but also no guarantee that your item can be fixed there. You will be expected to participate in the repair or learn how to repair it on your own at home. The emphasis is on community-building, keeping well-loved useful items out of the landfill, and learning how to make repairs on your own. We are members of the Vashon community who love to tinker and have a fervent desire to keep as many useable items out of the waste stream as possible. Funded by the King County Eco-Consumer Program the repair café is a collaboration of the Vashon Tool Library, Zero Waste Vashon and committed members of the community at large.